Let the fun begin. And this is for the kids and adults alike. Set up an egg rolling competetion and liven up your celebrations. 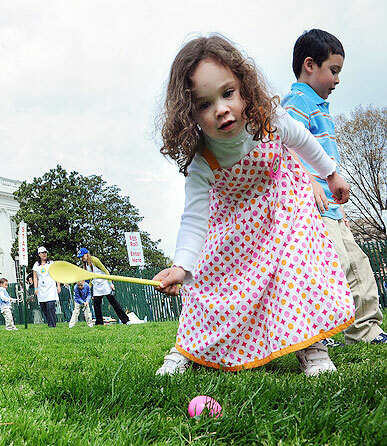 Egg rolling is a highly popular Easter time activity for kids and also for many adults who never seem to get out of their childhood days. Well, Easter egg rolling is for everybody and you should check out how it is played before you take a plunge. 1) A large open space, preferably a trimmed lawn or garden. 2) A handful of small pointed twigs. 3) A spool of thread. 4) Wooden spoons with long-handles/bamboo stakes. 7) Lots of energetic players. 8) Paints of various colours (blue, yellow, red, green, pink etc). 1) Mark race lanes across the lawn with long portions of thread. 2) Peg the threads into the ground with small pointed twigs. 3) Mark off a finish line with thread. The length of the line will depend upon how old your players are. 4) Boil some eggs. Let the players apply on them different paints to give a multi-coloured look. 5) Apply some glue on the entire surface of each egg to prevent them from breaking. 6) Provide each player with a hard boiled egg and a short length of bamboo stake/long-handled wooden spoon. 7) Ask each player to kneel at the start line with an egg placed at a feet before everyone of them. 8) As soon as the whistle is sounded, the eggs have to be rolled to the finishing post using just the stakes/spoons. This is quite similar to playing hockey. 9) The one whose egg crosses the finishing line wins. 1) Nothing except stakes/spoons are to be used to drive the eggs to their destination. 2) None of the players should stray into any of the adjoining lines. Doing this thrice would lead to an immediate disqualification. 3) None of the players should hit the easter egg of another player.